Page templates are a specific type of template file that can be applied to a specific page or groups of pages. Read more on WordPress about Why people use template files? Page template is used to change the look and feel of a page. A page template can be applied to a single page, a page section, or a class of pages. If a page template has a template name, WordPress users editing the page have control over what template will be used to render the page. Mostly people want different look, feel and functions at a specific page(s). WordPress let them create templates as many as they want. It’s nice if you have fancy and sophisticated templates ready on your theme. You can use them directly or easily create a template yourself based on them. Publisher properly answers this demand and provides large number of pre-defined Template Pages. Publisher has more than 200 page templates (in different pre-defined style) for Homepage and Contact Us pages. How Can I Use Page Templates? As mentioned, Publisher has more than 200 page templates. In every pre-defined style, you have more than 15 templates for homepage and 5 ones for contact form. Follow steps bellow for changing them. 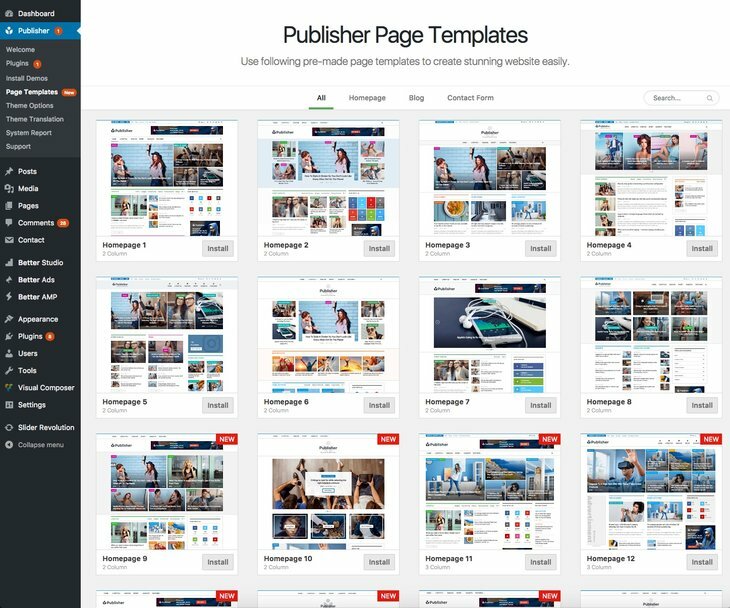 1- In theme panel go to Publisher → Template Pages, here you can see the list of all page templates for your current style. 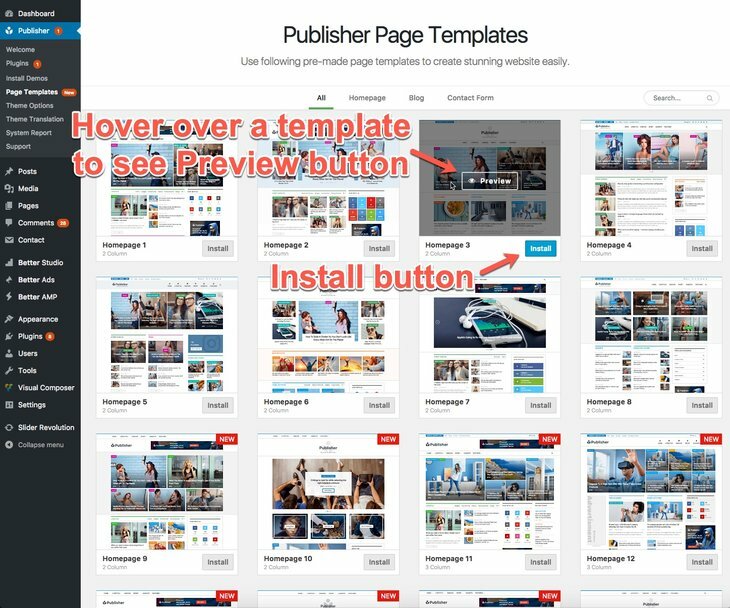 2- Hover them to see Preview button, click on it to see how your page looks with this template. When you install a Homepage template, new template added to your pages. When you install Contact Us template, you create a new contact form, for further information read Contact Form documentation. After installing page template, it is just added to your pages. You can find this new page in Pages → All Pages. For changing your homepage go to Settings → Reading now select new page in “Front Page”.